Size of Male: 40-55 lbs., 20-24 in. Size of Female: 35-42 lbs., 19-20 in. Color: Two color patterns: predominantly white with a mask, with additional patches of color or without, or solid colored with white trim or without. The Canaan Dog dates back to Biblical times and comes from the Land of Canaan, as you might guess from his name. It is said that they were the guard and shepherd dogs of the ancient Israelites. Alert, vigilant and devoted, the Canaan Dog is gentle with his family but reserved and aloof with strangers. They are very territorial and are natural guardians. They get along very well with children and can make very good family dogs. The Canaan Dog is an ancient breed that dates back to Biblical times. They are believed to be the guard dog and shepherd of the ancient Israelites and there are drawings on tombs of the dogs dating from 2200-2000 BC. When the Israelites were dispersed by the Romans, however, the dogs were left behind and many took to the desert where they lived with bedouins or as feral dogs. These dogs survived this way for centuries until the 20th century. At that time, the Jewish state was looking for a guard dog and a dog to help during times of war. A breeding program was set up for the Canaan Dogs and they served as sentry dogs, messengers, Red Cross helpers and land mine locators. By 1948, a studbook existed for the breed in the newly-created state of Israel. 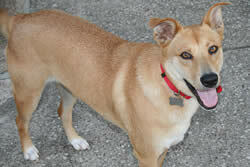 The Canaan Dog is curious, loving and loyal toward his family. However, he is naturally reserved and aloof with strangers. This breed is typically very territorial and protective. He is very prone to barking and challenging anyone who approaches without permission. However, this is not an aggressive breed. They are very alert and the barking does make them a good watchdog. You will need to set some limits when it comes to barking though. Make sure you teach your dog when to stop. Otherwise, he will probably bark more than you like. These dogs are highly intelligent and dog training is quite easy. These dogs do very well in obedience, agility and other dog activities. They are also very athletic. They are outstanding herding dogs and if you allow them to participate in herding tests or trials, they will be very happy dogs. These dogs are very good with children but it’s best if they are socialized with them from a young age. They may feel the need to protect your children from other playmates, so make sure they understand that all children are to be respected. They are generally good with other small pets but they can be territorial with other dogs. Socialization and training are recommended from a young age with this breed. Living Environment – The Canaan Dog can adapt to living in an apartment if he gets plenty of exercise. They will also do well with a yard of their own. As pariah dogs with a dense, harsh coat, they are usually alright if they have to spend time outdoors, but they prefer to be with their owners. They are fine in both cold and hot weather. Grooming – Grooming is very easy. They have a no-fuss coat that needs to be brushed every few days. They are seasonal shedders. Bathe as needed. Diet & Exercise – Dietary needs are normal. They require regular daily exercise. Like many other dogs, they can become destructive in the home if they don’t get enough exercise. These are very intelligent dogs and they do best if you can include games and other mental exercise in with their physical exercise. They love to work or have a job to do. Health – This is a relatively healthy breed. However, the following health problems have been seen at one time or another in the breed: canine hypothyroidism, epilepsy, progressive retinal atrophy, cryptorchidism, canine hip dysplasia, elbow dysplasia, luxating patellas (slipped kneecaps), and osteochondrosis dessicans (OCD). If you are interested in this dog breed you should talk to a breeder about possible dog health problems. The Canaan Dog is considered very intelligent and dog training is very easy. They love to work and they are very versatile. They have proven themselves capable of succeeding in many different dog activities such as obedience, agility, herding, and as a war dog. Use positive dog training methods (praise, reward) with these dogs and you should have no trouble training them. It is important that you begin training your dog at a young age and working on socialization when your dog is a puppy. These dogs tend to be territorial with other dogs and with strangers. Good training and socialization will ensure that they have appropriate good manners.